My name is David Derwin. I make hedging & risk management simple, straightforward & effective. 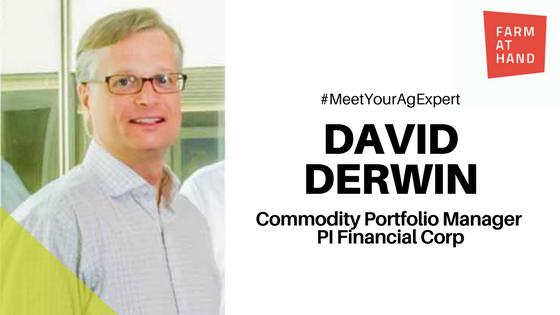 My current role is Commodity Portfolio Manager at PI Financial Corp. I help farm businesses protect revenue, manage risk and take advantage of pricing opportunities. A typical day includes studying market prices, analyzing charts, developing & explaining hedging strategies and meeting with clients. Almost 23 years, my first commodity trade was August 31, 1995. What’s something producers are surprised to find out after meeting with a commodity broker? There really is not a lot, nor should there be a lot, of trading on a daily basis in your commodity account. My first real job was working on the trading floor of the Winnipeg Commodity Exchange. Starting a tractor that was left unattended in the middle of a farm field when I was only seven years old. What is your favourite part of working in ag? Travelling & meeting people. Farmers wear many hats and are very good at figuring out the many moving parts of running a business. Use options & futures strategies to better manage your top line revenues and improve your bottom line.